Tehran, Iran—Relax. This is not a scary report about the threat posed by Iran’s gaining nuclear weapons. On the contrary, I’m telling a happy tale about a special kind of culinary charity called nazr that occurs in Iran. Traveling about this fascinating country, once known as Persia, I ate well, yes, but mostly I ate thoughtfully. Persian cuisine, you see, is highly symbolic: a humble plate of rice can be considered a prayer. Nazr is an Arabic word which means “an offering” or “to make a spiritual vow.” It is a supplication to God, in which the faithful offers something less valuable in hopes of receiving something of higher value in return. Charity is a key pillar of Islam, and the Qur’an is filled with stories of people doing acts of nazr, such as fasting, or assisting the needy. One of the most popular forms this custom takes in Iran, however, is practiced primarily by women and involves cooking for others. Usually motivated by the perceived need of an immediate family member, a nazr might represent the wish for a daughter to conceive, recover from an illness, or find a good husband. Then again, a son may require a spouse, a good job, or divine protection from such misfortunes as illness, injury and unemployment. To make her wish come true, an Iranian woman will strike a quite specific deal with God. She pledges to make a particular type of food that she will distribute to a specified number of people, for a certain number of days in the future. Usually, she’ll pick the anniversary of her prayer request being answered, and then cook for others on that date for the next five or ten years, or longer. I saw first-hand how this works when I arrived in Yazd, a city in central Iran, and dined in the house of a woman named Maryam. 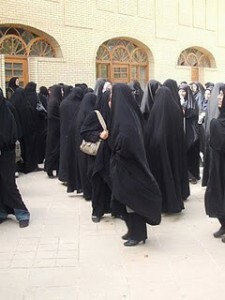 A conservative Muslim, she was dressed in a chador, or the full, body-concealing black robe women are required to wear in Iran since the Islamic Revolution in 1979, when the Ayatollah Khomeini overthrew Shah Pahlavi. Maryam held her chador shut at her chin with one hand, so she did all her cooking with her other, free hand. She worked alongside a gas cook top, with the flame turned quite high; I was worried the fabric of her chador would catch fire. Her cooking utensils were modest tin, and quite battered from much hard use. She used no measuring spoons or cups; everything was added with a practiced dispatch. One of her secret ingredients, she divulged, was home-made tomato paste—she’d cut up tomatoes, left them in the sun to dry out for three or four days, then pureed them with olive oil. What was the reason for her nazr, I asked? What was the wish she wanted from God? Every year since then, on the anniversary of his return to health, Maryam cooks enough to feed approximately 150 poor people. She intends to continue doing this, annually, for the rest of her life. Maryam did not appear to find this in any way remarkable. In a society where women face blatant prejudice and daily reminders that they are considered second class citizens, cooking a nazr is empowering, and makes them feel they have some influence over their destiny. In fact, just at this moment, a young girl showed up at Maryam’s door bringing a small dish of halvah—a fudge made from sugar, lard, nutmeg and cinnamon. 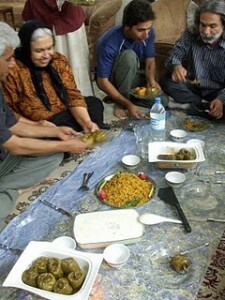 The custom is common among rich and poor Iranian women alike; those who are better off, however, will usually cook a more elaborate nazr in terms of decorations and types of food served. A nazr, however, can be something simple. Iranians have a taste for dates, almonds, or apricots that are picked green before they are ripened, and eaten with salt. They adore super-sugary candies (called “sweeties”) made with rose water, cardamom, and coconut. And every Iranian town has its own recipe for turning out hot, crispy flatbreads. More complicated dishes might be a hearty soup called ash, or beryani (lamb meat cooked with almonds), or fesenjan, made with walnuts, pomegranate and chicken. As I learned more about nazr, it began to make sense that this devotional practice should be so beloved by Iranian women. In a society where women face blatant prejudice and daily reminders that they are considered second class citizens, cooking a nazr is empowering, and makes them feel they have some influence over their destiny. Consider these facts. On Iran’s public transportation, women must ride at the back of the bus. A woman’s opinion is worth half of a man’s in a court of law. Women can have no contact with men to whom they are not related—even a handshake—without the presence of a male relative. Women are not allowed to be on the street, unaccompanied by a man. Given these deprivations, is it any wonder that women hope a home-cooked meal might influence things to go their way? You’ve heard the old cliche: “the way to a man’s heart is through his stomach.” The thinking of an Iranian nazr is similar, only it is God’s stomach which is being enticed. This certainly was my experience. 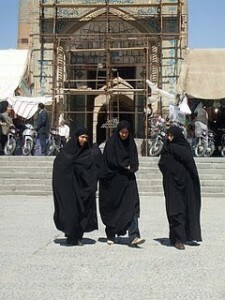 In fact, I was quite moved by the startling friendliness of Iranians I experienced. Not many foreign tourists visit Tehran, and especially not from the United States, a country with which Iran has no diplomatic relations. Yet, people on the street smiled, waved hello, and sometimes literally rushed up to me. When they learned I lived in New York, their grins and eyes would widen simultaneously. “Obama!” they would say. Or, “America. Good Country!” From those who spoke more English, I got the sense that they are as embarrassed of President Ahmadinejad, as many Americans once were of George W. Bush. 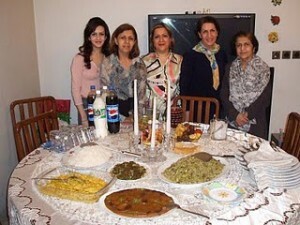 If you really want to feel the love, however, you need to be invited into an Iranian family’s house for a meal. This is not all that hard to manage. In slightly less than two weeks of traveling there, I was asked to a meal three separate times, and twice by total strangers. “Like an Iranian, of course,” I immediately replied. This made her very happy. She spread out a plastic tablecloth in the center of her living room floor, and then placed a fine cloth over the plastic. She served her family and me a plate of rice topped with stuffed peppers in pomegranate sauce. The best thing about dining on the floor is that when you overeat, as you’ll be forced to do by any self-respecting Iranian woman, you can simply lie down and stretch out at the meal’s end. 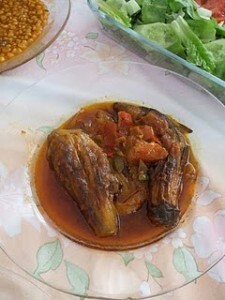 My hostess explained to me that cooking a nazr is not only a spiritual practice, but makes psychological sense, too. If the truth be told, though, Iranian women tend to cook for a big crowd, even when the number of guests is relatively small. One night, for instance, in the enchanting city of Shiraz, I was invited to a dinner party for eight, and our hostess probably made enough to feed three times as many. Before dinner, we sipped scaldingly hot tea and nibbled sohan, a crunchy, sweet Iranian confection made from butter, honey, saffron, sugar and pistachio that’s something like a praline. I asked a few of the other guests what sorts of food they would make for a nazr. As we chatted about Persian recipes, I wondered aloud about how there seemed to be saffron put into everything—sweet or savory. Oh, yes, the ladies agreed, saffron is not only good tasting, but good for you. “It steadies your nerves,” one woman claimed. These were affluent, and quite cultured women. I got the impression, for them, nazr is a kind of benign superstition, like saying “bless you” after someone sneezes. Indeed, they wanted to be sure I understood that nazr is not a Muslim custom, but something that probably originated in Zoroastrianism, a religion which began here in Persia in the 6th century BC, long before it was marginalized by the Arab invasion nearly a thousand years later. 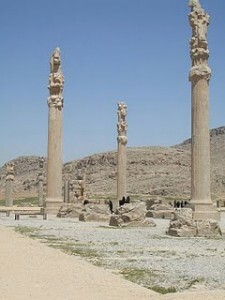 Another woman mentioned Persepolis, the ceremonial capital from the 6th century BC, ruins of which are only a few dozen miles from where we were sitting. 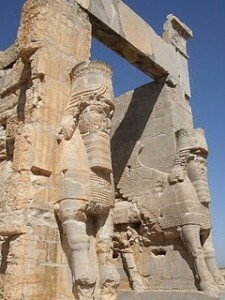 I’d visited this UNESCO World Heritage site earlier that day and learned Darius the Great, as well as his son, Xerxes, would come to Persepolis each Spring to receive tributes from all the lands and peoples under their rule. After dinner, a man named Kvos, drove me back to my hotel, and I asked him if it was typical in Iran to serve sweets before a meal, as a kind of appetizer, as his sister had that evening. No, he replied. This is only the case on special occasions, say a wedding, or some other festive meal. The ladies were spoiling me, he implied. We do things differently at festive meals in the United States, I explained, where typically we offer salty snacks as hors d’oeuvres, which cause people to become thirsty. Thus, they drink more alcohol, get into a happier mood, and the party becomes more jolly. Kvos smiled, ruefully, and assured me he is very well aware of how a “cocktail hour” functions, since things worked the same in Iran until the Islamic revolution. As it happens, The Park Hotel, where I am staying, was once the pride of Shiraz. Now it is a hard-worn spot, grimy and charmless, but Kvos recalls when it was first built, in the late 1960s, he spent many happy afternoons there, sitting by the pool in the courtyard (the pool is long gone), sipping whiskey and admiring girls in their bikinis. He finds it incredible, and I quite agree, that in his lifetime, the clock has been turned backwards in Iran, making it now a serious crime to get a little tipsy while ogling pretty girls on a lazy summer afternoon. 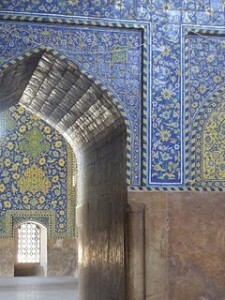 For many weeks after I returned to New York, I thought of all the marvelous things I’d seen in Iran. 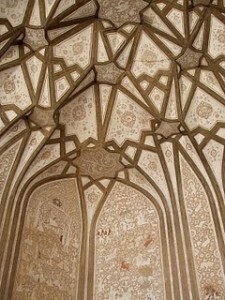 There were the handicrafts, such as blue and white painted pottery, and Persian rugs and kilims! And, the gloriously exuberant architecture. (By the way, Esfahan, a city built four centuries ago, its enchanting old town still mostly intact, must be one of the most dazzling spots on earth.) 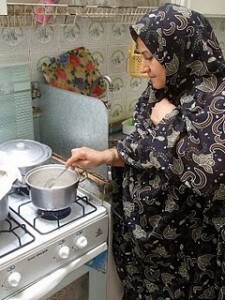 Mostly though, I kept musing upon how Iranian women volunteer to cook for others. My thoughts would return to Maryam, and her pledge to God to make food once a year for 150 people for the rest of her life—all prepared in the tiny kitchen of her small cottage. Everything in her house was spotlessly clean, even though four people (Maryam, Amir, and their two small daughters) all lived, ate and slept together in one room, where there were a few well-worn carpets on the floor and throw pillows leaning up against the walls. It was here, after I’d watched her prepare our lunch, that we sat down together to tuck into lamb cooked with yellow split peas, and an eggplant stew called bademjan. With not much arm-twisting from Maryam, I ate seconds, then a third helping—as did her husband, Amir. Soon enough, completely unselfconsciously, Amir put his plate aside, lay back on the floor, and folded his hands on top of his ample belly. Within seconds, he was asleep. Maryam smiled. She then turned a fond gaze towards Amir, who was snoring softly. This sound, this proof that he was alive, provided the only answer to my question. I’ll give Persian chef Najmieh Batmanglij, the final word.